✅1080P - Best Lens and Image Sensor along with wide angle view. This camera shoots at 1080p at 30 frames per second with a bit rate of approximately 24mbs. The camera even records well in low light! Here is your C1881 Spy Hidden Charger Camera (No card reader) from CousinsShop™! SIMPLE SETUP: Works right out of the box. Just one easy step - insert your SD card. 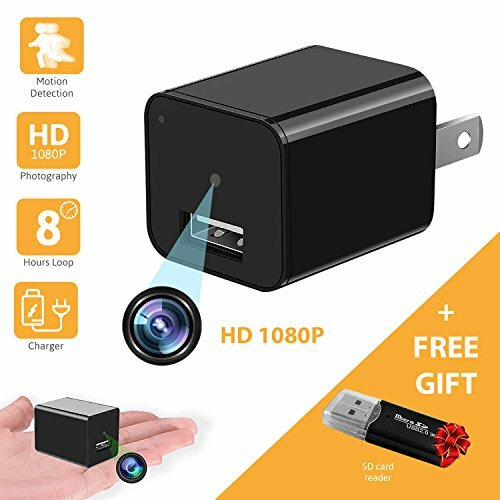 Simple camera charger for any surveillance. Keep an eye on your baby, nanny, maid, employee, coworker, significant other. Make sure they are in safe hands. No need to worry any more! NEW 2018 VERSION: The updated camera provides a HD 1080P high resolution video at a 90 degree wide angle view. Camera now features: Motion Detection, Loop recording, Charging device, Record on SD card up to 32GB. PEACE OF MIND: We know you have options, but we want to ensure you get the best with us, and that's why we promise a full 100% QUALITY PROMISE! Ships from the USA. We know you'll absolutely love it, but in the rare instance you don't, simply contact us and we'll issue a full no questions asked replacement or refund! MOTION DETECTION: Activated simply by a switch on the back of the device. When motion is detected the camera will automatically record until motion is no longer detected. You can import and playback videos from your SD card. LOOP RECORDING: Continuously record series of 5-minute videos. When your camera has reached its maximum memory (approx. 8 hours of video), it will automatically record over the earlier 5-minute video files in a looping fashion. If you have any questions about this product by OMEGAWARE, contact us by completing and submitting the form below. If you are looking for a specif part number, please include it with your message.